Dear one and all, almost four months ago our big trip around the block in the Beast came to an end and we have returned to our humble abode in the leafy Brisbane suburb of Chapel Hill. Hubby spent the first month back cleaning the Beast; vacuuming up all the red dirt that had infiltrated every nook and cranny and applying copious amounts of elbow grease to get the Beast nice and shiny, inside and out. It was a real credit to him. We advertised the Beast on the internet, posting the ad on a Wednesday. On the Friday had a call from a couple who were very eager to see it and that Sunday the chap flew up from Tasmania. The next day a deposit arrived in our bank account and thus the Beast was sold, luckily to a great couple who, I’m sure will enjoy it as much as we did. It sat on our front lawn for another month while their funds became available and only then did we actually part with it. As it drove out of our street for the very last time, I was sad to bid it farewell. The fond memories of our luxury trip around Oz will be preserved in the many images and videos I took. Returning to civilization again gave us the pleasure (read “stress”) of dealing with utility suppliers so that we could have the luxury of things like TV & internet, unfortunately their call-centre employees, who have names like Dave and Betty but speak with distinctive Indian accents, don’t know their elbows from their arse holes (excuse the French). Having the knowledge that we would be back on a certain date gave us the advantage to line up the installation ahead of time so that, as we walked in the front door, we would have these essential services immediately available at our finger tips…or so we thought! At some stage, during the 15 months we were away, the NBN was rolled out in our suburb (for anyone not living in Australia this was supposed to be top notch fibre-optic technology to give us increased internet speed to rival….hmmm let me think; Uzbekistan or Outer Mongolia perhaps). Unfortunately the coordination between the NBN and our tel-co was sadly lacking and the fact that our last tenants removed the all-important NBN box from our premises meant that they needed to do a new installation then wait for an undetermined length of time depending on the phase of the moon and the tidal flow of the Brisbane River for one to notify the other that everything was in place. This took another four days, I guess they couldn’t just phone one another or send an email but no; the courier pigeon is still obviously the preferred mode of communication, I just hate the thought of them trying to squeeze one through a strand of glass fibre! After several days with still no internet I decided to phone our tel-co to track the progress of the poor courier pigeon. As we are now connected to the NBN we can no longer plug a phone into the wall socket and be able to talk to people, now the calls are all made via VOIP (Voice Over Internet Protocol) which works great as long as you have, you guessed it, the internet. Luckily we had mobile phones, albeit on “pay as you go” monthly basis; until the same tel-co, which shall remain nameless, decided to forget to apply my automatic payment that month which left me without a mobile phone as well. You have to love the Indians, such an optimistic mob; when I phoned (using Hubby’s still functioning phone) to report our issues they said it could take up to 24 hours and asked if it would be best for them to call me back on my landline or mobile phone….DOH! And hubby wonders why I prefer to be on the road; a perpetual Wandering Segal. Not ones to sit still for too long, earlier this month we made a small road trip to Sydney to celebrate my father’s 90th birthday. This time we traveled in the comfort of a our new Prius V. It can’t be said that the Wandering Segals don’t like to go from one extreme to the other. The Beast was the ultimate fuel guzzler getting about 4.5 Kilometers per litre compared to our hybrid Prius which uses a mere 4.5 litre per 100 kilomters. Suffice it to say it cost us less to drive to Sydney than to fly. We did, however feel a tad invisible, not one truckie, grey nomad nor delivery van waved to us as we drove along in our plain white sedan. For those of you who are not yet bored with all the images I’ve posted on social media, you can find more pictures and videos of our travels with the Beast via the links below. See some of our videos here. See a gazillion photos here. When I was in my early 30’s, we uprooted ourselves and our children from our cosy life in the Eastern Suburbs of Sydney. From the rear windows of our 4-bedroom, double brick abode we had views to Bronte Beach. Our home for the next seven years was on a farm in Queensland’s Darling Downs near the little rural township of Maryvale. There we build our home and established greenhouses where we grew carnations; thousands of them. One of my tasks was to deliver the flowers to several florists in Brisbane twice a week, a round trip of nearly 300 km each time. 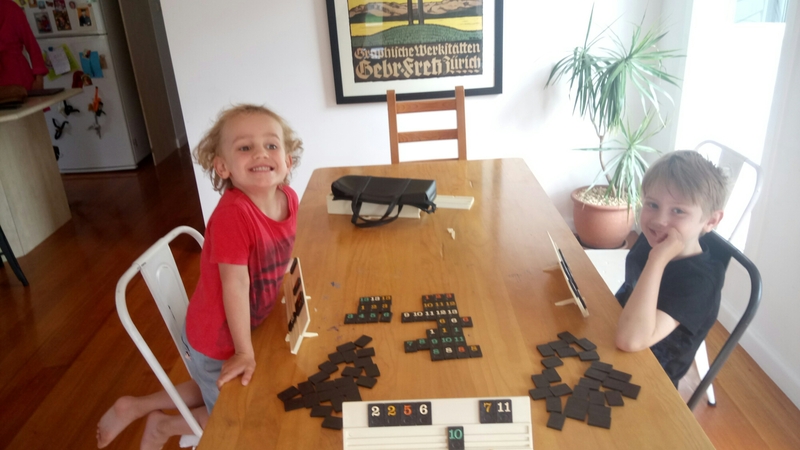 I would set out in our old Toyota Liteace van as the sun was rising over Cunningham’s Gap and usually returned in time to pick up our sons from the local two room school at 3 in the afternoon. Along the road to Brisbane each morning I would pass a white delivery van travelling in the opposite direction, usually somewhere between Aratula and Mutdapilly, and each time the driver would wave to me. The first time this happened I wracked my brain all day as to who this person was and how did he know me. In Sydney, as I drove through across the Sydney Harbour Bridge to and from work each day, no stranger would wave to me, except perhaps to occasionally flip me the birdie as I blithely weaved in and out of the peak hour traffic, and consequently I presumed that if someone was waving to me I must be acquainted with them. The next time it happened I told Hubby and asked if he knew of anyone with a white delivery van. It was certainly not anyone from our tiny village. Perhaps it was a shop owner in the nearby town of Warwick, where we did all our business transactions. It was such a small town that everyone knew us by name. It was not unusual to enter a shop/pharmacy/bank/post office and be greeted with: “Good morning Mrs Segal, how are the boys?” But, no, we couldn’t think of a soul who drove a white delivery truck. It continued to occur twice a week for over a year until, one day, we bought a new vehicle, a shiny red Mazda Bravo 4×4 dual cab ute with flaming decals along each side; affectionately known as “Suzy’s Truck” by all who knew and loved it. On her maiden voyage into Brisbane, laden with fresh flowers, I was flabbergasted when low and behold, the delivery truck driver waved to me again. I was sure I would slip by unnoticed. WTF! How did he know I’d bought a new vehicle? I couldn’t wait to get home and tell Hubby. Fast forward 20 odd years to 2008 when, having long-ago sold the farm and moved to Brisbane, we retired and bought a Toyota Landcruiser and caravan and set out on our big adventure around Australia (for the first lap). Soon after we had taken our first turn off the main highway and were heading inland along a country road, a similar combination of old farts towing a caravan appeared on the horizon and as they drew close enough to see the whites of their eyes, the driver lifted his left hand from the steering wheel and waved to us. Hubby and I turned to each other, our mouths simultaneously forming perfect O’s, two pairs of eye brows arched high towards our respective hairlines. Had the delivery truck driver from all those years ago also retired to become a Grey Nomad and was now stalking us? It didn’t take us long to realise, after passing several other Grey Nomads, that it is common, country traveller courtesy to wave to fellow travellers, and the more remote the location the more enthusiastic the wave, from just a laconic raised finger from the driver, to all occupants, whole hands wildly gesticulating. It was somewhere about then that I realised that I had, in fact, never known the delivery truck driver personally; he was just being a courteous country traveller. Since embarking upon our latest trip 14 months ago, we have noticed that there are many more travellers on the roads these days; caravan parks need to be booked in advance and it even pays to arrive at the National Park Campgrounds well before noon if you want to secure a suitable campsite for the night. The departure date of our first trip had coincided with the catastrophic, 2008 GFC, and many self-funded retirees were forced to cancel their caravan orders and postpone their big trip as their retirement funds in the stock market dwindled overnight to almost half their value. Some caravan manufacturers were even forced to declare bankruptcy when so many sales evaporated. 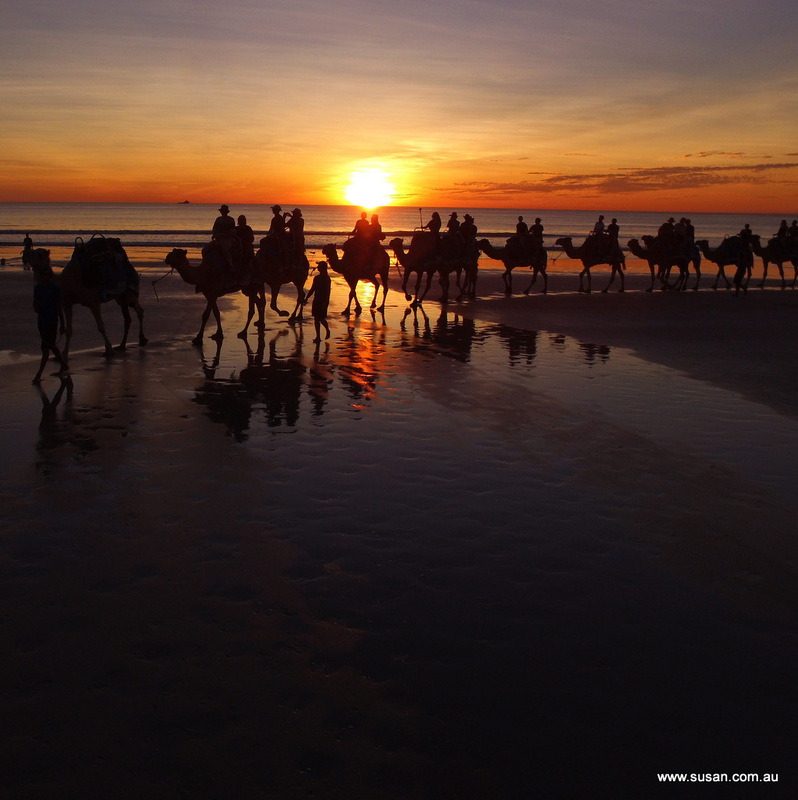 Well, in the nine years since then, the stock market has made a remarkable rebound and the roads and caravan parks are clogged with Grey Nomads once again, and we wave to all of them as they pass us on the highways and byways of rural Australia. Though we sometimes get strange looks as they pass us, mouths hanging open and brows knit in consternation as they try to determine exactly what we are. If we don’t wave first, they sometimes fail to wave at all, simply because they think we are a truck or a bus or something else completely. It seems that the courtesy only extends to like vehicles; truckies wave to other trucks, bus drivers’ wave to other buses, delivery van drivers wave to other delivery vans, and Grey Nomads wave to other Grey Nomads and seeing as how we somehow fall into all these categories, everyone waves to us. 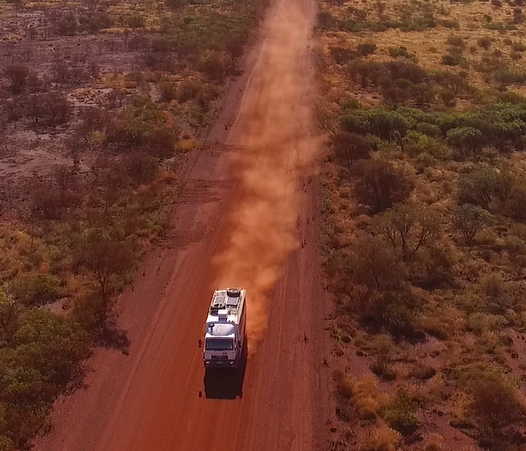 While I was driving along one particular stretch of rather boring scenery between Katherine and Tennant Creek, I decided to count the number of travellers coming from the opposite direction. In a one hour period, mid-morning, 60 grey nomad type vehicles passed us and they constituted about 80% of the total traffic, sometimes in groups of three or four, sometimes singularly. That equates to one a minute, and that doesn’t take into account that of the other 20% of vehicles we encountered, 80% were either buses or trucks. I’m beginning to think I need to invent an automatic hand that, at the touch of a button, will shoot out the driver’s side ¼ window, and wave in a regal fashion to the passing hoards, not unlike the hand that would indicate a stop or turn on the buses that were around when I was a child, back in the olden days. Must have an adventurous spirit and a full set of working tools – please send photo of tools. Okay, well it’s not that serious yet but I’m just getting this ad ready for when one more thing goes wrong and hubby finally resigns. It has all been my fault as I insist we take “the road less travelled” or as it’s better known out here, “the road more corrugated”. While still in the Pilbara, it was all going swimmingly, as we departed Karratha. 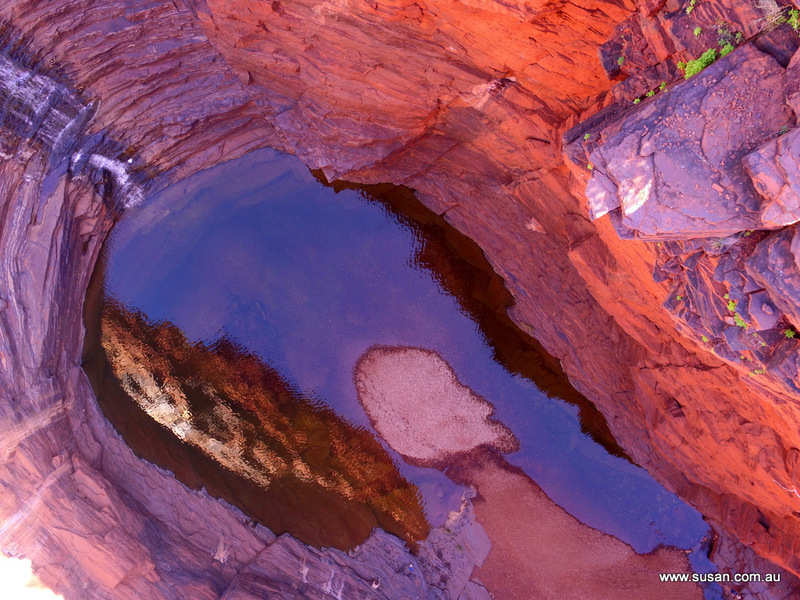 We had sat through the induction video and obtain our permits to drive along the Rio Tinto Railway Access Road heading towards Karijini National Park and although it was a dirt road the whole length, it was very well maintained and not a big effort to traverse. Eventually we arrived in Karijini National Park and the dirt roads continued; some pretty good and some less so. 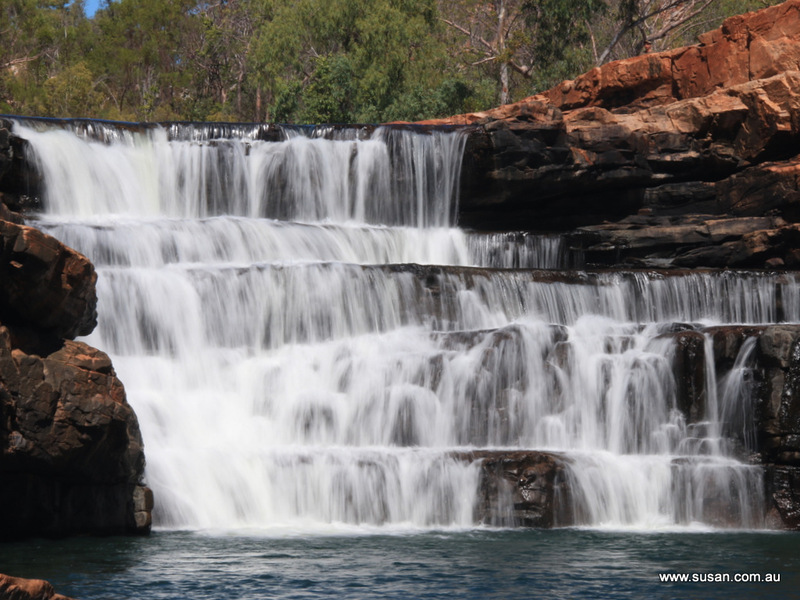 Karijini is a stunning national park with many picturesque gorges and water falls and, depending on your level of fitness, abundant hiking trails to explore. I wore hubby out, hiking into every possible gorge, but it was well worth it; the stunning views of the steep, red-walled gorges reflected in the clear blue water of the ponds and rivers below were breath taking. The gorges were gorgeous! Leaving Karijini we were blessed with a bitumen road and hubby thought he had it made, until we pulled out of the roadhouse at Auski and onto the road to Port Hedland where a passing 50m long road train (not all the mining companies can afford their own railway system) threw up a rock which bull’s eyed our wind screen. 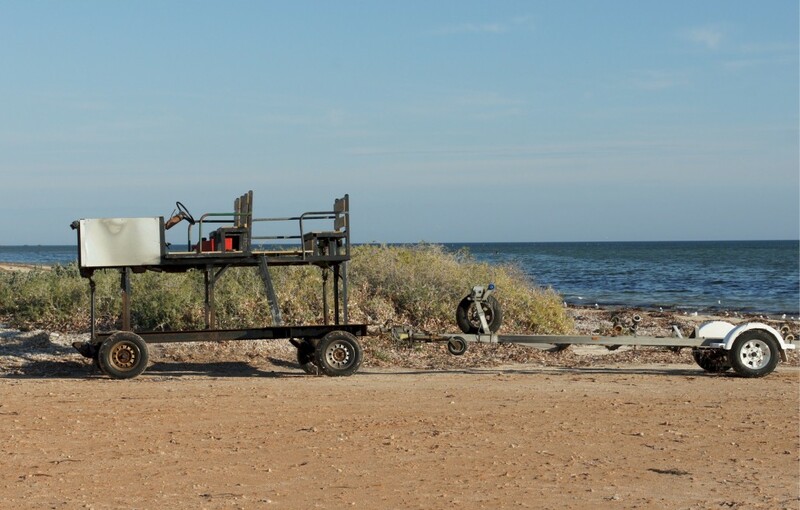 Luckily our insurance covered 90% of the cost but it did mean extending our stay in Port Hedland waiting for one to arrive from Perth almost 1,800 km away. 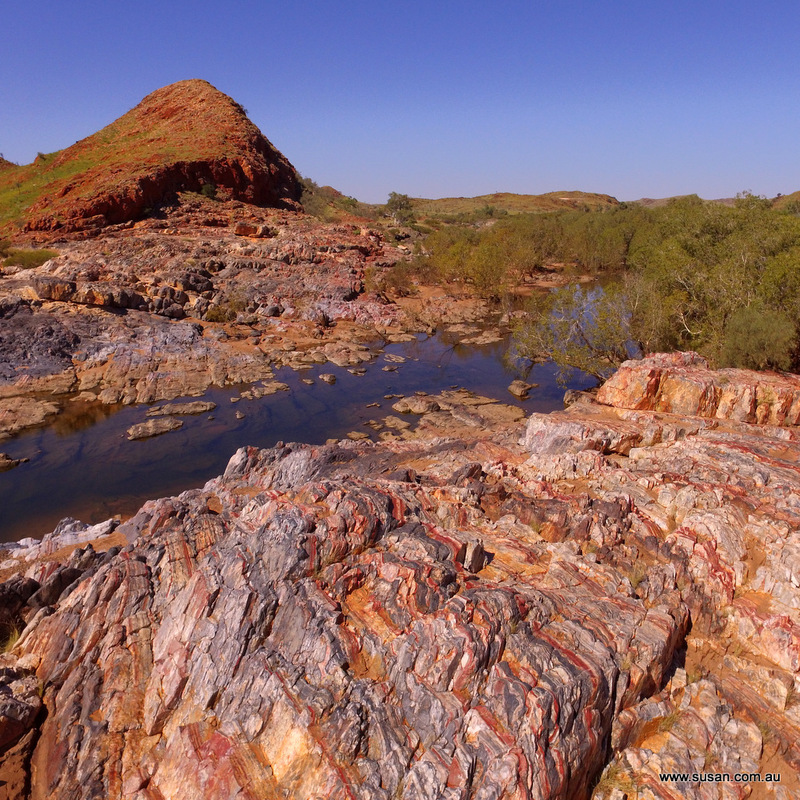 After it was installed we took a small detour to Marble Bar on our way to Broome; a mere 400 km out of our way, and worth it, even if it did entail a “short cut” comprising a long section of dirt road via Pardoo to Cape Keraudren on the coast. 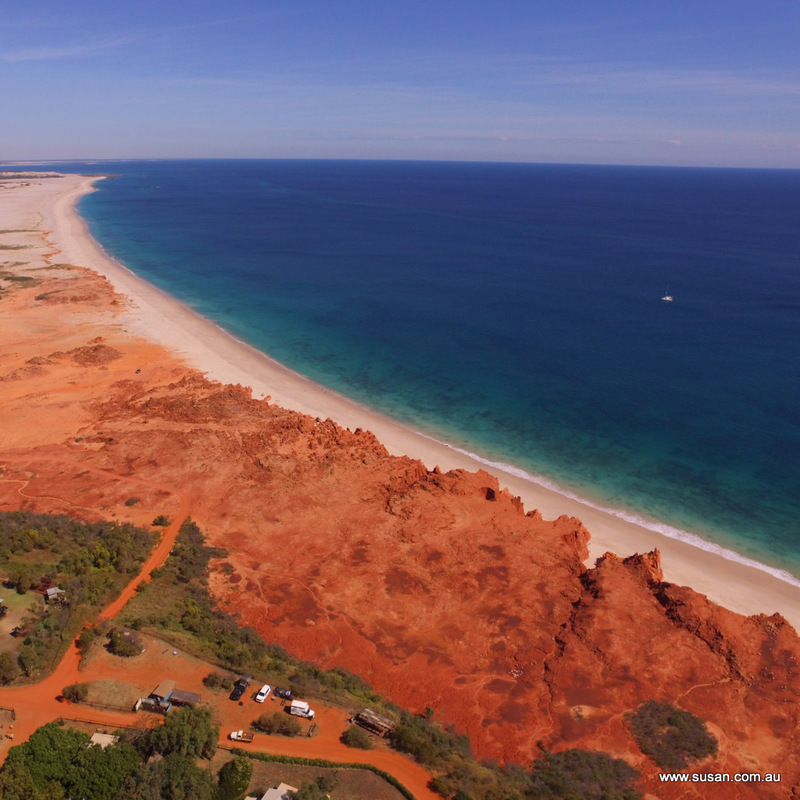 In Broome I was successful in convincing hubby to, once again, hit the dirt roads and take a side trip to Cape Leveque, a round trip of less than 500 km. Halfway up the cape, at Beagle Bay, we discovered oil dripping from our transfer case after we had engaged low range 4×4. From there to the tip of the cape the road was bitumen but, by the time we got there, the oil was pouring out. Luckily there was a mechanic in residence at the Kooljaman Resort. He told us we had blown a seal (I didn’t remember meeting the seal, and he certainly didn’t even buying me dinner beforehand). Our oil topped up, we were able limp back to Broome, albeit without engaging low range, and there we waited for more spare parts to arrive, this time, from Sydney; the glory of driving an imported truck. Hubby did try his hardest to convince me to scrap my plan to traverse the Gibb River Road, a 660 km long, notoriously rough, dirt road between Derby and Kununurra with many rougher side tracks to various gorges along the route. But would I be deterred? The first day was a breeze with about 30% of the road being bitumen, the balance being slightly corrugated and very dusty. 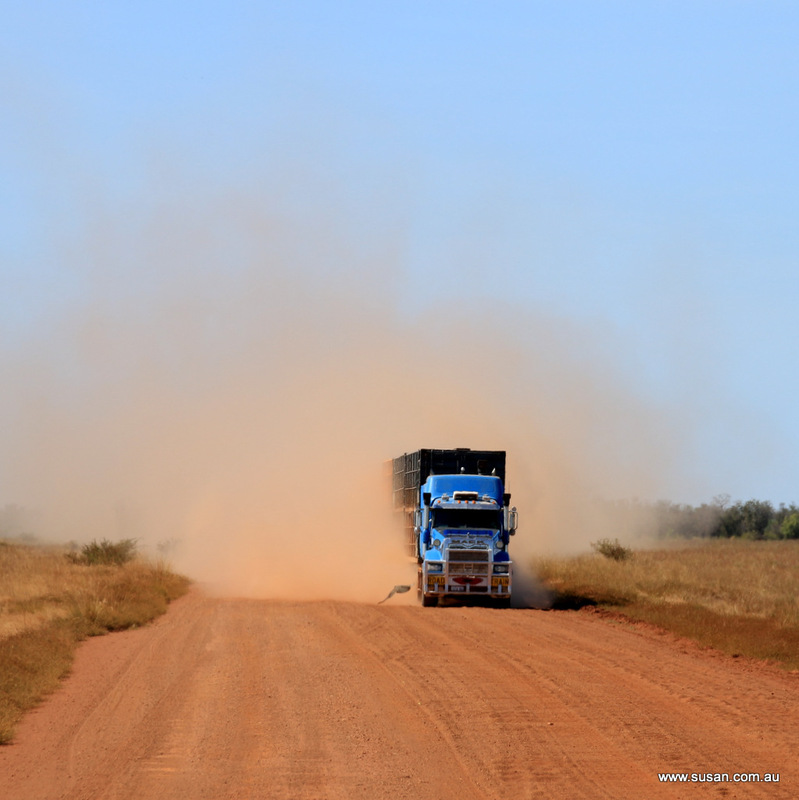 The biggest obstacle was seeing through the dust kicked up by passing road trains. 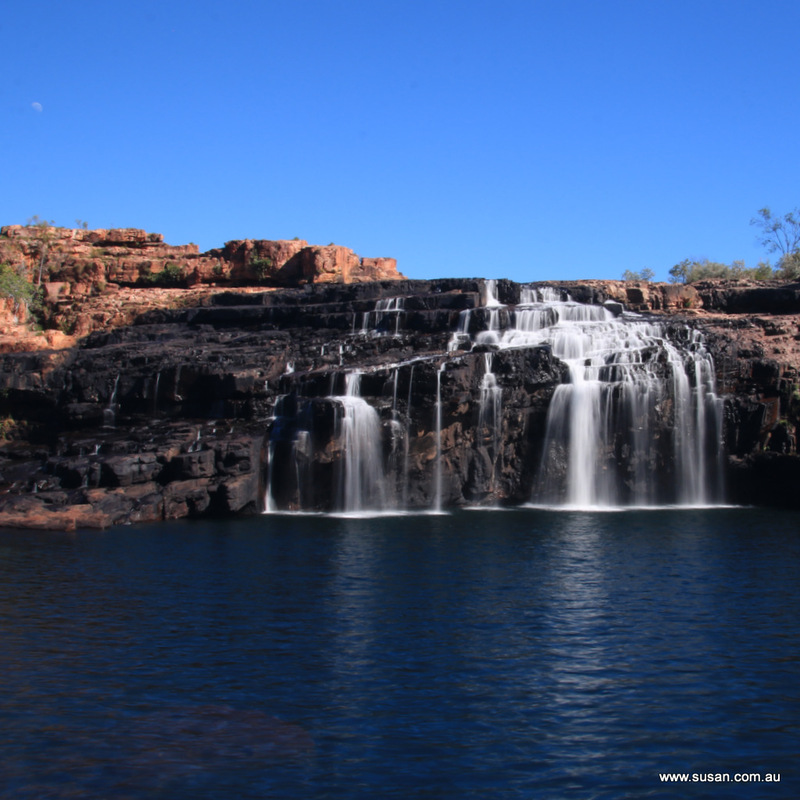 We camped at Windjana Gorge for the night and the next morning made a trip to Tunnel Creek. 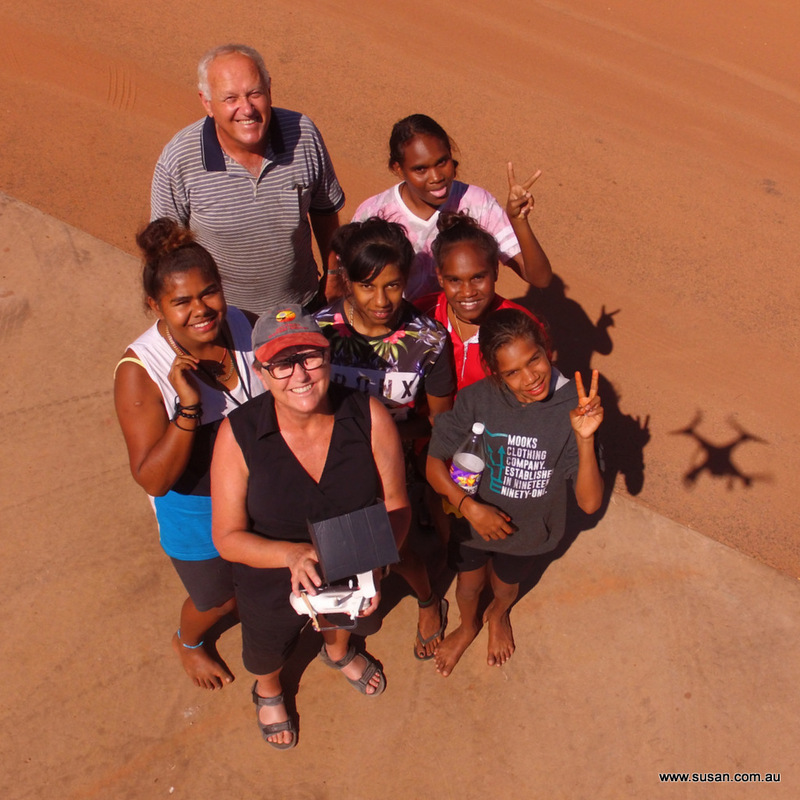 By day 2 the road had deteriorated but it was still not as bad as the road to Cape York we did last year and it did not deter us from making a few side trips. 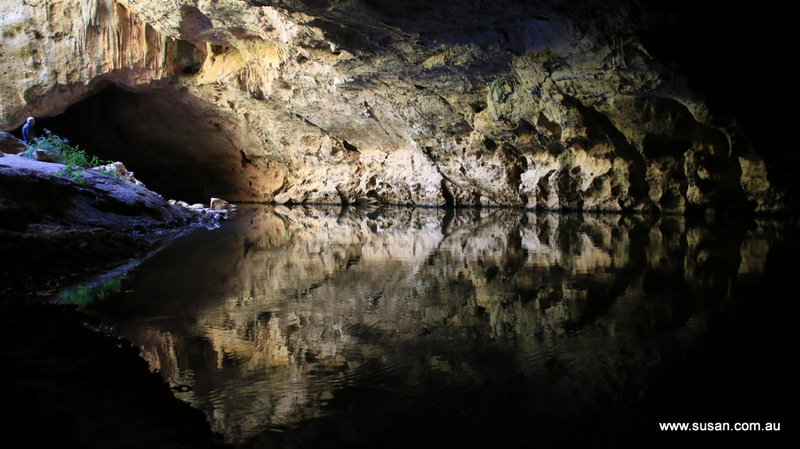 Over the next two days we travelled into Bell Gorge, Galvans Gorge and then Manning Gorge. On day 5, by the time we had hiked the 5 km round trip to Manning Falls and back, ferried across the Manning River by means of a tinny and length of rope, and collapsed back at our campsite, hubby was just about over gorges and would have been happy to have Scotty beam him up straight back to civilisation. Then the radiator started leaking. At this point hubby was prepared to throw in the towel but I told him it was only a small leak and we did, after all, have 500 litres of water on board the Beast, having just filled up at the Mt Barnett Roadhouse where we had also gloated that, unlike the other suckers, with a 400 litre Diesel tank we were not forced to buy fuel at $2.05 per litre. I did however concede defeat in my endeavours to convince hubby that we should include a quick side trip to the Mitchell Falls, a mere 1,000 km return trip on even rougher dirt roads. And lucky I did, because as we motored passed the turn-off, and were not more than 5 km into the home stretch with only 350 km to Kununurra an ominous rumbling beneath the Beast brought us to a grinding halt. Upon inspection to the Beast’s under belly it became apparent that things were not as they should be. The drive shaft (that long tubular thingy that makes the wheels on the bus go round and round), was dangling at an odd angle. The bracket that held it straight was hanging from the underside of the chassis, split in two places. Definitely not good! My first instinct was to send out a “Mayday” call over the CB radio on UHF frequency, to no avail; no repeater stations within Cooee of here. Hubby’s first instinct was to sell the Beast for scrap metal and fly home. 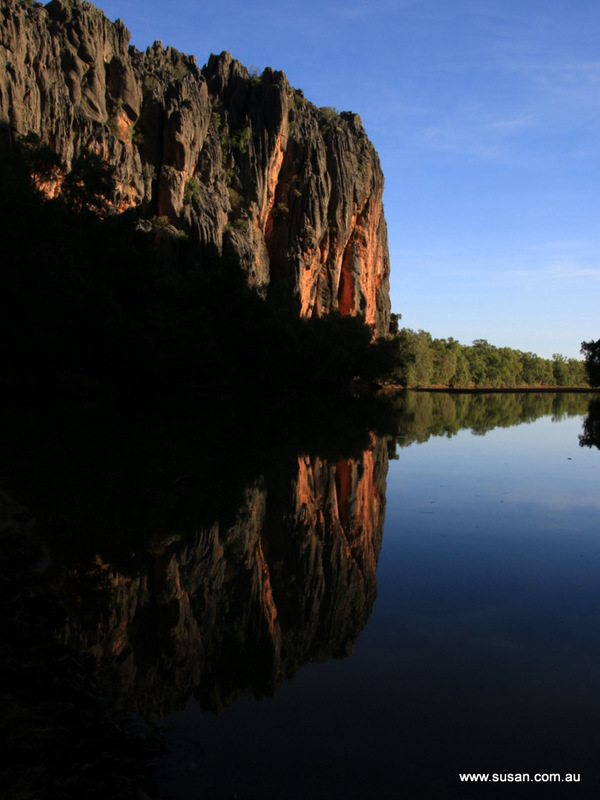 As with the road to Cape York, the Gibb River Road is no longer the road less-travelled, in fact, it is very well-travelled. Within 10 minutes of us putting out our hazard triangles a cloud of red dust appeared on the horizon heralding the arrival of our heroes; a young engineer named Cameron and his partner Tanya, with satellite phone at the ready. We hastily called the closest facility, Ellenbrae Station, 50 km away. 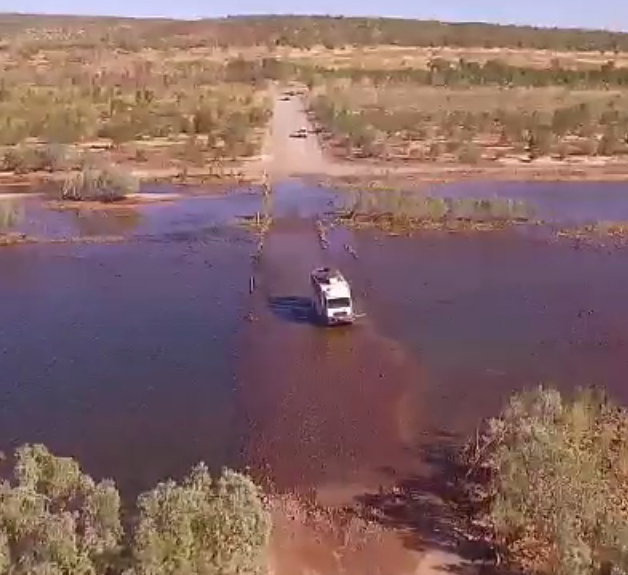 A very helpful chap named Logan answered our call and said he would try to organise a tow truck from Kununurra and we should call him back in 30 minutes to see if he’d been successful. Unfortunately, Cameron, Tanya and their Sat-phone were heading to Mitchell Falls, but they took our calling card and GPS coordinates and promised to call Logan from the Drysdale River Homestead, over an hour’s drive away, and if he’d had no success, would arrange with someone from Drysdale to summons a tow truck for us. We settled in for the duration and cracked open the tucker box. Halfway through lunch we heard a car pull up. It was Cameron and Tanya back again. They had got just 5 minutes down the road when they decided to call Logan back to see what he had been able to organise. Unfortunately he’d been unsuccessful in finding a tow truck this side of the next full moon but he would drive out to see if he could help us. What a lovely couple; they even refused our offer of financial compensation for their satellite phone call. Although we did thank them profusely at the time, in the hubbub, we unfortunately forgot to get their contact details so we have no way of contacting them tell them how truly grateful we are for their assistance. Within the hour Logan, with big white Akubra hat and his handy tool box, pulled up in his trusty Ute. He said that, at great expense ($4,000), a tow truck could be procured from Derby, but not for at least three days. Thank goodness he had the foresight to call a mechanic mate of his and upon his advice proceeded to disconnect the whole rear drive shaft from the transfer case to the rear axle thus enabling us to motor on once we had engaged front wheel drive. It was not a free service and he was rewarded handsomely for his assistance; at least the Beast had less weight to carry with our wallets now empty. The corrugations increased in depth and breadth and there was one wide river crossing to negotiate before finally, after three days of limping along, we arrived at the turn off to El Questro Station and were overjoyed to finally get back onto the bitumen. At last hubby could to get out of 2nd gear and really ramp it up to the break neck speed of 60 km per hour and by lunch time we were in Kununurra. That was 4 days ago and we are still here and will be for the foreseeable future until parts can be located and shipped in. We might be eligible for permanent resident’s rates at the caravan park if we are here much longer. While Logan and hubby were under the Beast, disassembling our drive shaft, I overheard hubby comment that I might need to start advertising for a new driver, and while I was at it, I should stipulate that he also be a Diesel mechanic. It was then that I started to pen my opening advertisement, let’s hope I don’t need it any time soon. ​My bucket list just got shorter by one major event; on Friday the 12th of May 2017, I finally fulfilled my wish to swim with the Whale Sharks. 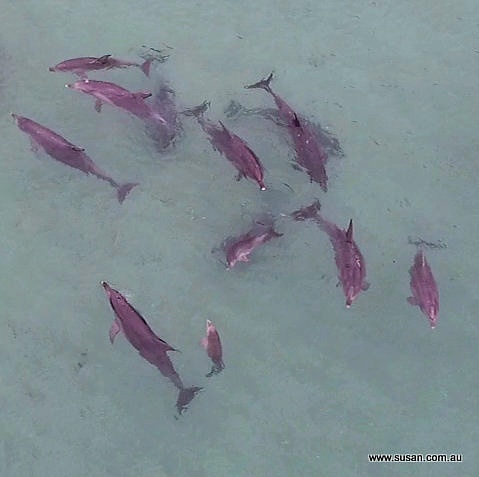 These majestic creatures visit Ningaloo National Marine Park every year following the spawning of the coral on the reef that fringes the most western point of Western Australia, along Cape Range National Park near Exmouth. My first attempt was eight years ago when we were doing out first lap around the block in our Landcruiser and caravan but I had timed it all wrong arriving a couple of weeks too early, evidently I needed to have coordinated my arrival with the first full moon after the Autumn equinox; when the planets were aligned, but we had tickets to fly from Darwin to the UK a month later and could not afford to hang around waiting for these gentle giants to arrive. Ever since then I have had this on the top of my bucket list. Lucky for me I have a daughter-in-law, Bec, who had her listening ears on when I was telling her we were planning a trip to Ningaloo, this time around, especially to see the Whale Sharks and not long after, on my 60th birthday, low and behold, there was a voucher to swim with the Whale Sharks in my birthday card from both my sons and their wives…what treasures they are. 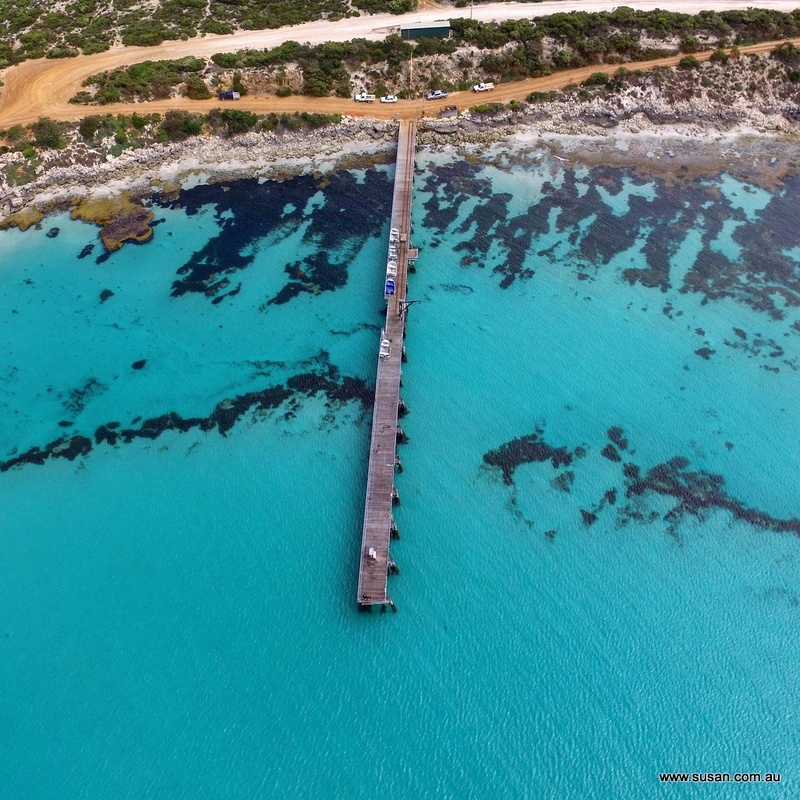 We arrived on the peninsular a few days early and spent some time camping in the Cape Range National Park, snorkelling in the coral rimmed, pristine bays. We hiked into the various gorges and the spectacular vistas from atop Yardie Creek Gorge were breathtaking, as was the trek up Mandu Mandu gorge, talk about puffed out! I was hoping to find some emergency defibrillators nearby. Having survived Mandu Mandu Gorge, by Friday morning I was well rested and ready for anything. Bright-eyed and bushy-tailed, at 7:20 am I rendezvoused with the bus to take me out to the boat harbour. After several days of very choppy conditions, luckily the sea was relative calm this day but being a poor sailor, I took a couple of pills just in case and only just managed not to hurl burley overboard en-route to the outer reef. By 10:20 am the spotter plane had located the first Whale Shark of the day and we motored to within swimming distance of it and dropped off our crew member, Sian, who indicated to us the most opportune moment to dive in. Geared up with goggles and snorkels and decked out in stinger suits, due to the recent arrival of Urunganji Jelly Fish on the reef, (just another one of Australia’s life-threatening creatures), we were poised to take the plunge on the cry of, “Go, Go, Go” then swim like the clappers for the 100-200 meters that separated us from Sian’s waving, yellow rashy clad arm. The visibility was still fairly poor; it was a bit like looking through aqua milk but as we were told to expect, within 2 metres of us the giant fish suddenly appeared before our eyes, all 6 meters of it, as if out of the ether, one minute there was just ocean and the next, there is the largest fish in the sea staring us in the face. It was awesome. Although the Whale Shark was just idling by, we on the other hand, had to swim hell-for-leather just to keep up with it. After repeating this endeavour 5 or 6 times over a period of an hour and a half, by the last time we returned to the vessel I was about to collapse. It’s a good thing my bucket list is getting shorter. That’s me on the left, with the whale shark on the right. Travelling around Australia for the past year, I’ve been amazed by so many beautiful things that weren’t even on my bucket list, but certainly should have been. I think the whole trip is one big bucket list. So what’s the next item to cross off? I’m not sure; I’ve still to see the cherry blossom time in Japan, the wildebeest migration in the Serengeti or the trees change colour in the North American autumn. But I really need to leave something on the list, because, let’s face it, once I’ve ticked every box all that’s left is to kick the bucket, so maybe I’ll leave the bungee jumping in New Zealand to last; my great grandkids can push me there in my wheelchair on my 99th birthday. I like to have something to look forward to. 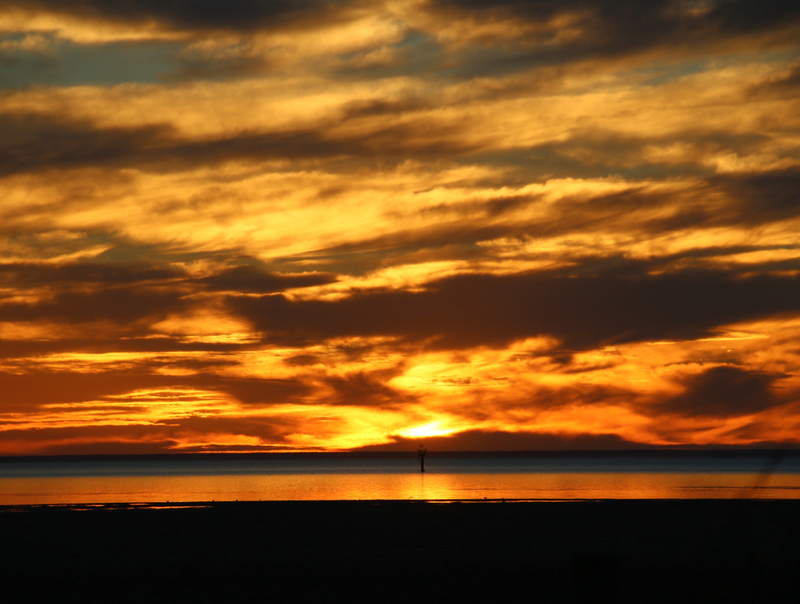 That is, of course, until our paths crossed and we met the heat wave head on in the Coorong National Park in South Australia. 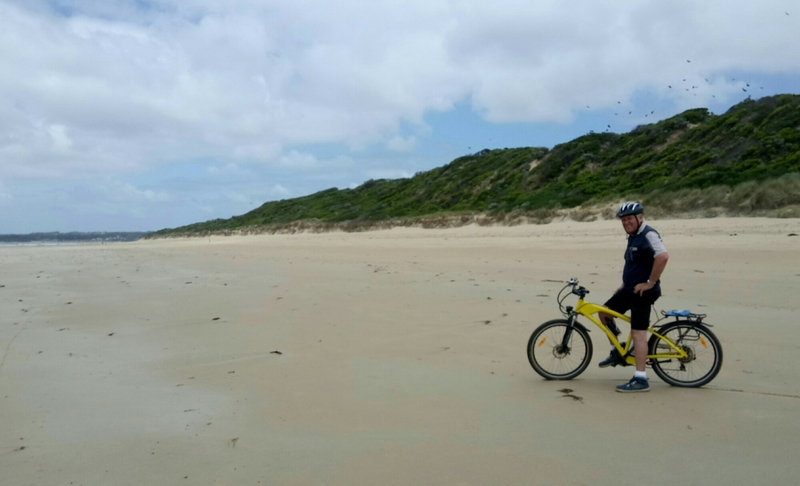 We had pre-booked (and paid for) a camp site (unpowered) on the banks of the Coorong Lagoon at Parnka Point. That very same morning we had departed Pinks Beach wearing jackets and long pants. By mid-afternoon in the Coorong , the thermometer in the Beast had hit 41°C and I was forced to employ my BERCA (Body Evaporative Reticulated Cooling Aid) to try to maintain a reasonable body temperature and to stop my brain from boiling. Eventually, after continually re-hydrating my BERCA and having the water evaporate after one nano-second we bit the bullet, upped stumps and drove into Meningie where they tantalisingly offered a powered site, which to us spelled A/C. Unfortunately due to the fact that the South Australian government only had a week’s notice of the impending heatwave and thus insufficient time to push a button that would ensure there was enough power when the entire population of South Australia simultaneously turned on their air conditioners, load shedding was implemented, completely cutting power to tens of thousands of households, including ours. In the beast it was still so hot that I was forced to do something I would normally consider sac-religious and put the red wine in the fridge to get it to cool below body temperature, when they say “serve at room temperature” I’m sure they don’t, in their wildest imaginings, consider a room will ever be over 40°C. And away went the winter doona’s and out came the summer ones again. From Meningie it was only 140km; and a drop of 15°C, to Victor Harbour where we stayed a couple of days to do the umpteen loads of washing that accumulate in the week or so between caravan parks, before heading across to Kangaroo Island, with the Beast, where we spent 6 days in temperatures bordering on Arctic. Kangaroo Island is so far south that, from the Cape Borda lighthouse on the west coast, the last “RRRREEAALLLL lighthouse left in South Australia”, according to our guide, Mike, if you sail off in a westerly direction you would miss Western Australia completely, South Africa too and not hit land again until South America, and in a southerly direction there is naught between it and Antarctica. And away went the summer doonas and out came the winter doonas again. 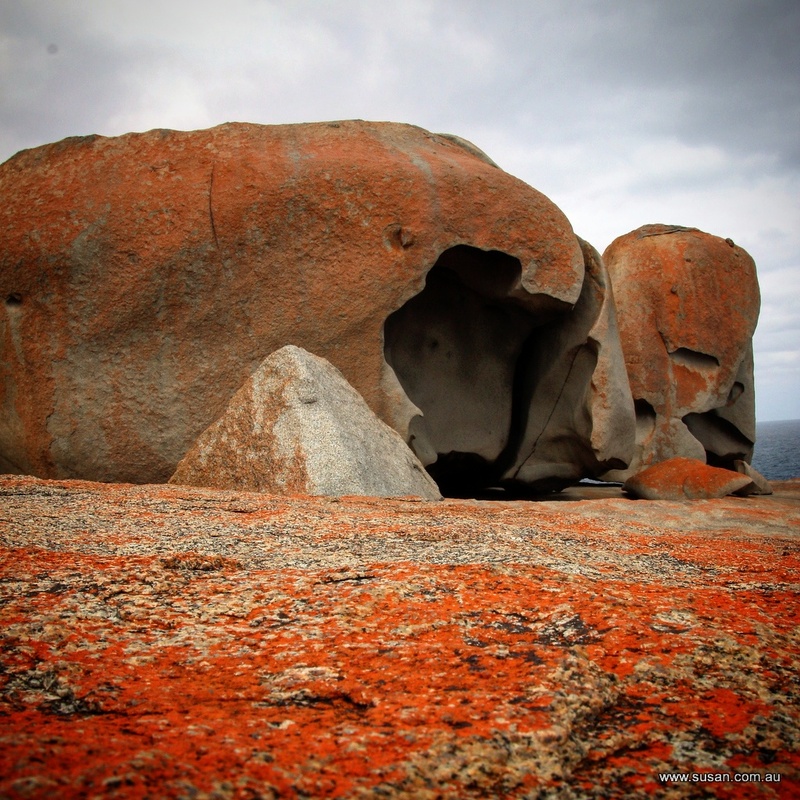 Kangaroo Island enchanted us with its bounty of wildlife and interesting geology. 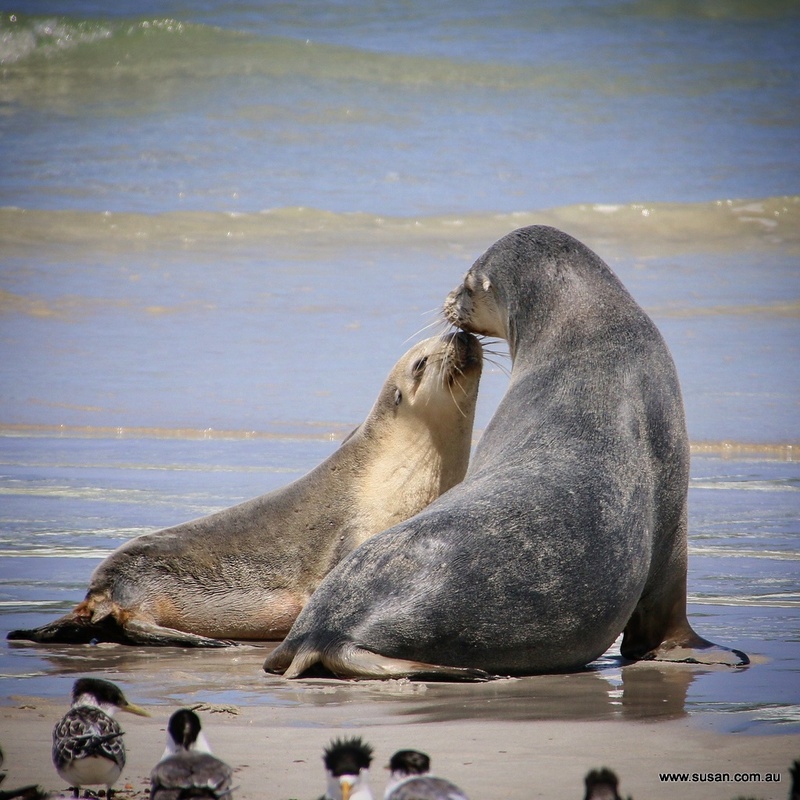 At Seal Bay we saw Sea Lions, not seals, and at Western River Cove we happened upon a large pod of dolphins with very young calves in tow frolicking in the clear, azure waters of this delightful, picturesque bay. I was torn between the temptation to leap in with a group of young Dutch back-packers to swim with them and the opportunity to capture it on film with my drone; the drone won, but I’m still regretting not leaping in to swim with them; Next time perhaps? Upon returning to the mainland the weather was still comfortably mild; that is of course until yesterday when we arrived at the campsite at Port Parham, a campsite we visited on our previous trip around the block about eight years ago. They have improved the free camp and it was well subscribed, with dozens of others there before us. 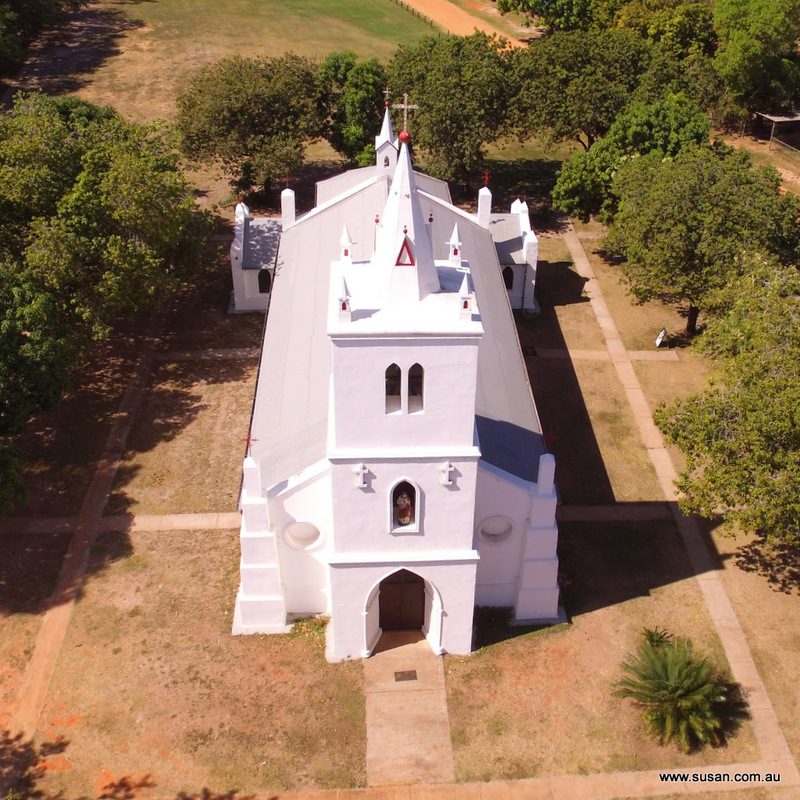 But the temperature had climbed steadily on our journey north from Adelaide and when we arrived it had hit 32°C; not unbearable if you can find a shady spot in the breeze that was not yet occupied by a gazillion flies and mosquitoes. Although the name “Port Parham” would suggest that there is sea a plenty, let me tell you, the only thing that could navigate the waters of this port is a surfboard. In fact, to get their boats out to water deep enough to float them, they have devised an ingenious device called a “Parham Jinker”. It resembles Fred Flintstones’s model T with the wheels on the ground but the body on stilts. 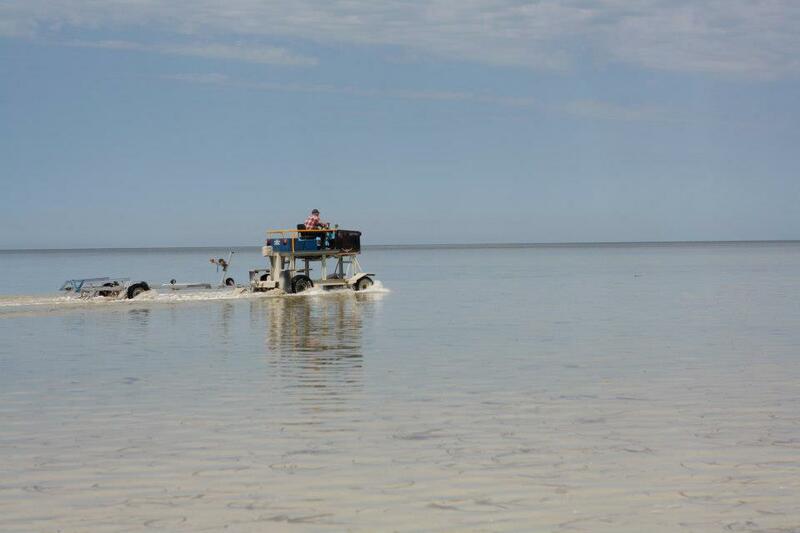 The very shallow beach was void of any water as the tide, when it goes out in Port Parham, goes way out and it was but a distant streak on the horizon beyond a kilometre of mud flats, so bathing in it to avoid the heat and the mozzies was not an option. ​As we approached Melbourne my trepidation grew, my impending 60th birthday was looming fast. Turning 60 had evoked in me a wave of existentialist emotions. 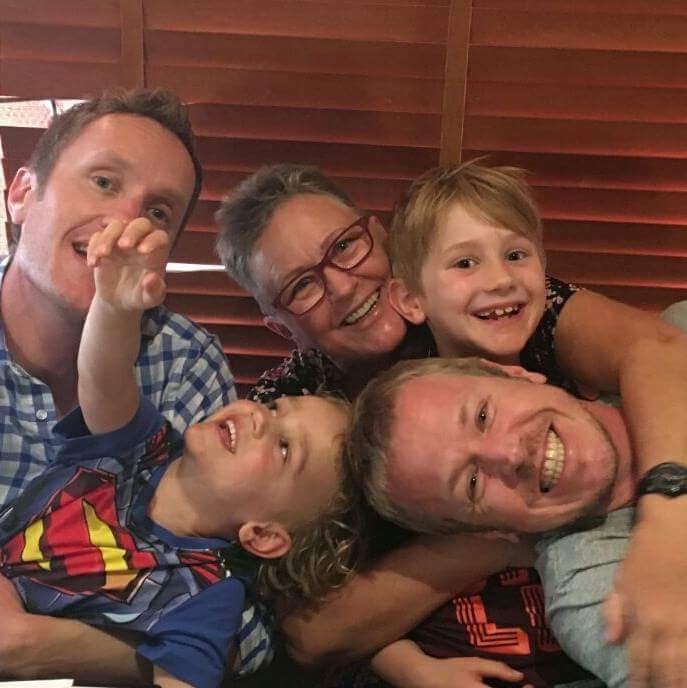 But upon arrival into Melbourne all that was soon forgotten when our two grandsons greeted us with squeals of delight and we were soon wrapped in their warm embraces. 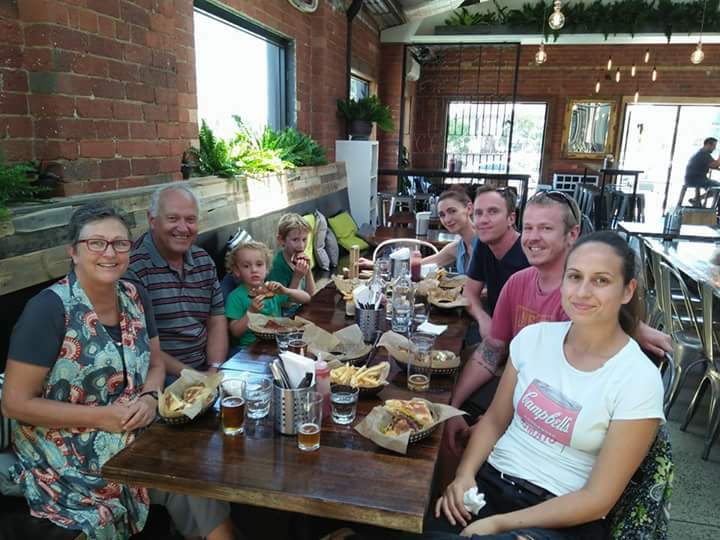 Our elder son invited us to join him and his family for lunch at a nearby boutique brewery. As we were all seated and perusing the menu he made a statement, “wouldn’t this be perfect if the whole family could be here” and at that moment in walked our younger son and his wife who, unbeknownst to us, had flown in from Brisbane to help us celebrate, not just my 60th, but hubby’s 65th and our elder son’s 40th. I’m not usually an emotional person, but it brought me to tears; tears of happiness to have our children and grandchildren all there together. They had connived to surprise me and had succeeded with flair. Our younger son and his wife stayed for three days before it was time for them to return to work in Brisbane. 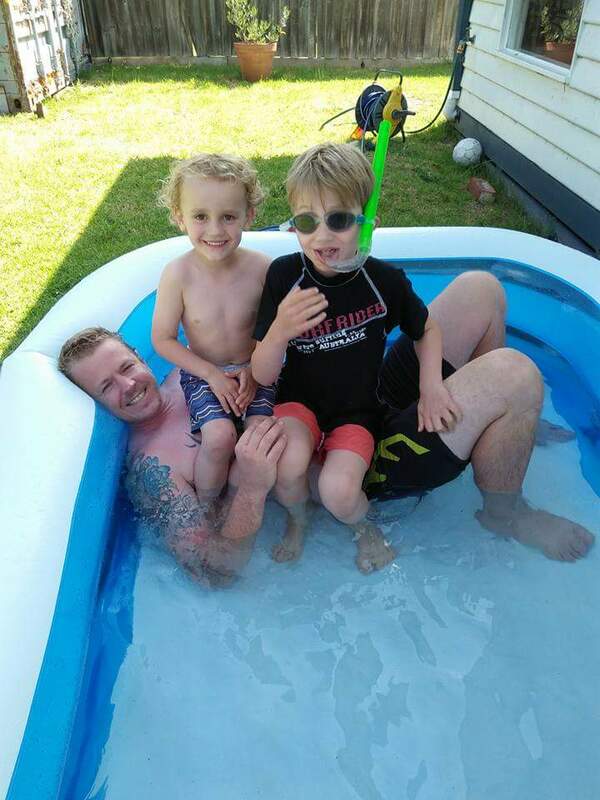 We were all sad to see them go, but especially our grandsons, as they had enjoyed romping around with their Uncle Guy, who is, on so many levels, just a big kid at heart. My family thoroughly spoiled me, for my birthday I received a voucher to swim with the whale sharks in Ningaloo Marine National Park, Western Australia. It has long been on my bucket list and this year I will fulfill my dream. We stayed on for another week, babysitting while their parents had the rare opportunity get away for a few days alone. We took the boys swimming and had faces painted, went bike riding, played with Lego and endured endless games of Uno and Rummikub, did many puzzles, created artwork, had lots of cuddles and story times and even had dinner at MacDonald’s one night; this being the pinnacle of indulgence as far as they were concerned. We also hosted sleep-overs in the Beast which was parked in their driveway and amazingly fitted with millimetres to spare, dwarfing the house. All in all we made the most of every minute. 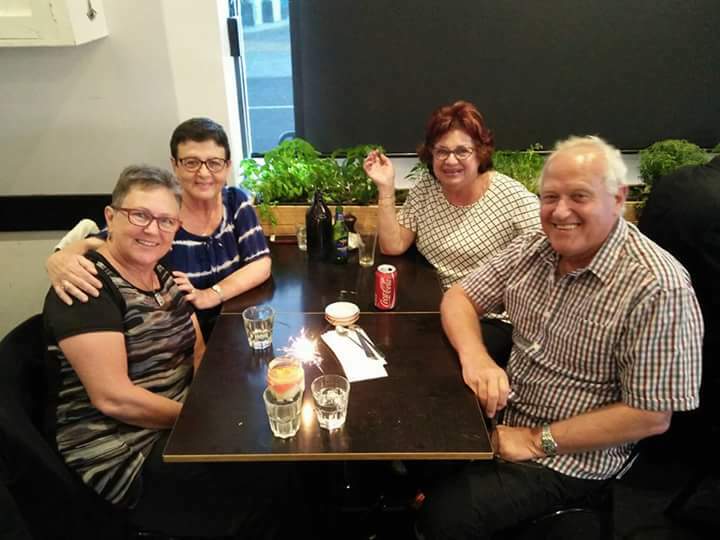 During our stay we also managed to dine out with some of our Melbourne friends a few times and toward the end of our stay Hubby said we might need to start looking for work. “What, to pay for all these meals out?” I asked. And I thought all my clothes were shrinking. Two days ago we departed Melbourne; it was heart wrenching to leave our grandsons (and their parents), but they have a new set of grandparents recently arrived from Wales to lavish them with love and attention. On our way out of Melbourne we drove down Hawthorn Road towards Caulfield so hubby could visit the library where he buys second hand Hebrew books. The road is fairly narrow with tram tracks running down the middle and low slung cables crisscrossing the road. The beast is nearly 4m high and I feared some cables might get snagged by all the paraphernalia we carry on the roof racks. I was too terrified to look in the rear view camera for fear of seeing a tangle of cables and power poles being dragged in our wake. Hubby was just disappointed that we didn’t have the right attachment to connect to the cables and get a free ride through town. We returned to the Beast after visiting the library to find some large vehicle (or tram) had sideswiped the mirrors on the driver’s side and in the process shattered the side quarter window. Luckily MAN Trucks had a branch in Melbourne, not too far out of our way and when I rang them they confirmed they had the window pane in stock, though they couldn’t fit it themselves, for that we would need a specialised glass repairer. They provided us with the contact details of a local company only 5 minutes away and we were lucky to get it fitted within the hour. Our insurance covered all but $100 dollars of the bill. 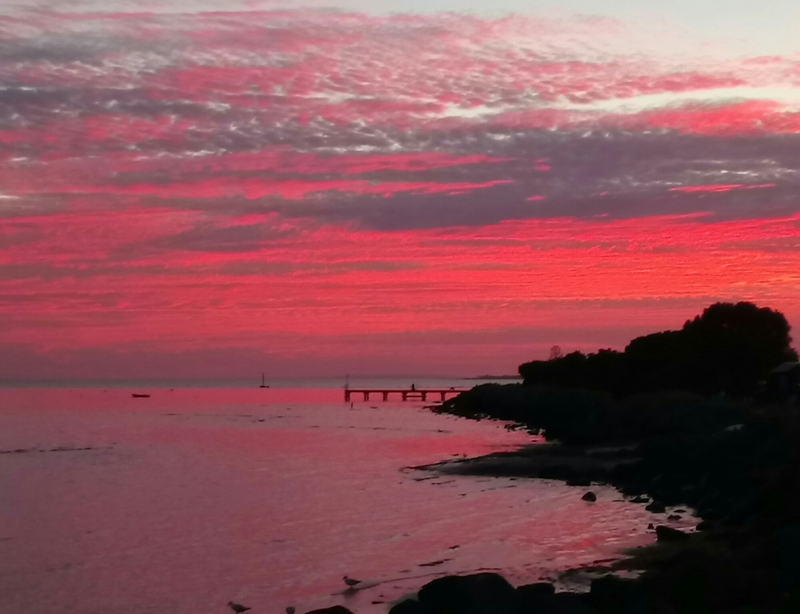 So while our leisurely drive down the west side of Port Phillip Bay was somewhat disrupted, we were still happy as it could have been a good deal worse if we had had to wait days or even weeks for the part to arrive. And now we are having a short holiday, from our permanent holiday. Yesterday we arrive at a delightful resort in the seaside town of Torquay where we will stay for four nights before we continue along the Great Ocean Road towards South Australia. This morning we took the bikes down and went for a long ride out to Point Impossible. After the bike path ended the remaining two kilometres was along a badly corrugated, dirt road. While it was uncomfortable to drive along corrugated roads in the Beast up to Cape York, it was a whole different level of discomfort doing so on a bicycle. I now know why it’s called Point Impossible, because from this point on, it will be impossible for me to sit down for a week. And you all think we’re having fun; sheeeesh! As the year draws to a close we have reflected upon how truly exceptional 2016 was for us. When we travel, and I take photos of most of the places, I store my photos in files by date, so that every place we visit becomes a new folder; this year I have added 150 new folders, and we still have two weeks till it ends. It started with a trip to South America and a cruise to Antarctica. As we sailed by snow-capped mountains and huge icebergs and were captivated by the cute penguins and seals, we both commented that this was the highlight of our holiday. Until the cruise terminated upon our arrival in Buenos Aires and we flew to the Iguazu Falls and then we said THIS was the highlight of our holiday. But then, on the return leg of our journey, we flew to Santiago and took a tour of the Andes and saw the majestic Condors and then we said THIS was the highlight of our holiday. At the end of it all we both agreed that the whole holiday was the BEST holiday on so many levels, and as most of you are aware, we’ve had a holiday or two in our time. 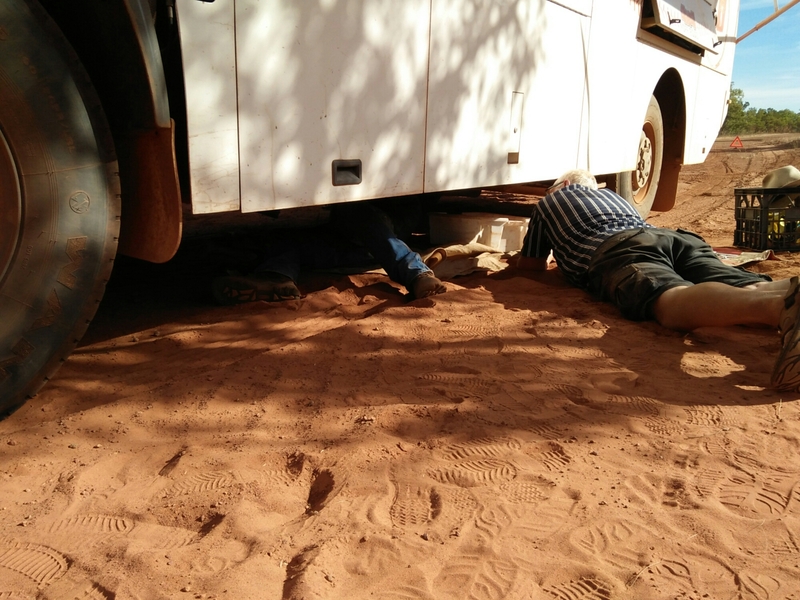 The year just continued to impress, with our return to Australia and our great adventure in the Beast up to Cape York and back, although we encountered the odd hiccup along the way, like the air conditioner breaking down, the experience was still amazing. Then in November we headed overseas again, this time to the Netherlands for 10 days where, as always, we felt so at home with our beautiful Dutch family, and spent days driving through and marveling at the quaint villages and rolling countryside. From there we enjoyed 10 amazing days in Greece criss crossing the country with hubbies brother and sister-in-law, laughing and eating till we were almost busting. Israel was our next stop where hubby had his class reunion and we caught up with many old friends and laughed till we cried. We visited friends and relatives all over the land and everyone delighted in feeding us even more. We rejoiced in the fact that they didn’t weigh us, only our luggage before boarding the return flight to Australia. Back in Oz, and we were reunited with the Beast who had sat sulking at the storage facility near the airport, and just to get even with us for having neglected it for 6 weeks, refused to start. Roadside assistance got the battery recharged and we were on our way again. As I write this we have been on the road again for over 30 days and are currently enjoying some fantastic weather and fresh air in the Snowy Mountains, in southern New South Wales. From here we will head further south to Melbourne where we will celebrate three big birthdays; our elder son turns 40, hubby turns 65 and I will celebrate the 20th anniversary of my 40th birthday. We feel truly fortunate, and we fear not the wrath of the evil eye in saying so out loud. We haven’t knocked on wood, nor said “tfu, tfu, tfu”, because we don’t believe in all that stuff, you see, we are both Capricorns and Capricorns are naturally skeptical. The only thing that has tempered our happiness is the knowledge that so many of our friends have suffered this year, with either reduced capacity, illness or painful operations; themselves or their elderly parents, spouses, children or grandchildren. I will not name you all as you know who you are and we hope that at this festive time of year you can gain some strength and hope from whatever religion or belief system you follow. Just know you are in our hearts and thoughts always. To all our Jewish family and friends we wish you a Happy Chanukah, to the Christians we wish you a merry Christmas, to all the Athiest among you, we hope you enjoy time off over the long weekend and to everyone; have a happy, healthy and safe 2017. The Grey Nomad Segals Blog at WordPress.com.